The Santa Cruz Beach Boardwalk set the scene for a memorable field trip enjoyed by grade 6 students in June. On the agenda for the Sixth Grade End-of-Year Boardwalk Blast was a day of fun in the sun! “We had a terrific day at the Boardwalk. The students really seemed to enjoy themselves, and it gave them a wonderful memory with which to end their first year at the middle school,” recalled grade 6 lead advisor and English teacher Patricia Lai Burrows. The inaugural event was planned by a committee of grade 6 teachers. “At the beginning of the year, five sixth grade teachers formed a committee to plan a celebratory end-of-year trip for the grade 6 students. 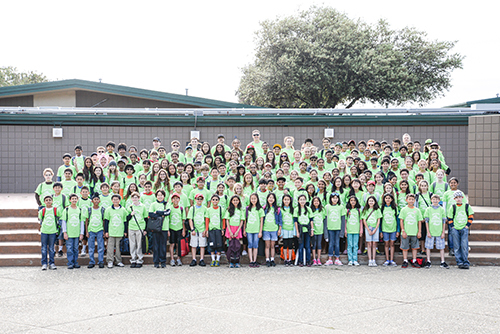 Every year, the sixth grade attends a field trip on the Tuesday of the last week of school. In the past, we have visited the Chabot Space Center in Oakland, the Cal Academy of Science, and last year we went to Roaring Camp Railroads. This year, we wanted to plan a trip that we knew the kids would love and remember; this gave birth to the Boardwalk Blast field trip,” explained Lai Burrows. The students started their day by playing in the sand, waddling ankle deep into the cold ocean water and just having fun together. When the amusement park opened later in the morning, they ventured over for thrilling rides, fun games and yummy food. “The students rose to the occasion beautifully; they behaved politely, respectfully and gratefully. And, because of the location, there was something for everyone to enjoy,” said Lai Burrows. Upon the students’ return to campus, they united by wrapping up the day – and the year – with a special gratitude circle. “Even though it lasted for just under five minutes, it gave each person at least one opportunity to share what they appreciated about the day with someone else,” she added, noting that the outing was such a success it will now become an annual tradition. In other year-end middle school news, back in May, grade 7 students celebrated the coming of summer by having a special on-campus activity day with their advisors. Also in May, eighth graders went on a celebratory field trip to Great America.